Add needed support to the bathroom without making permanent modifications. 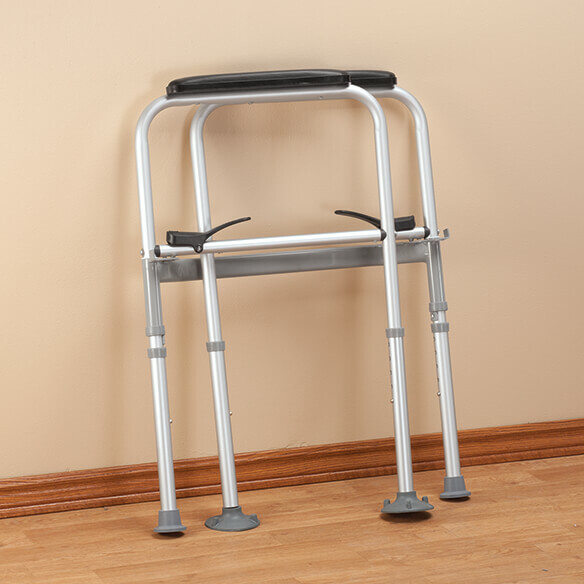 Sturdy steel frame is easily height-adjustable (31" - 35") and supports up to 300 lbs. 21" L x 20" W.
To assist wife after back surgery. My sister cannot use the regular bathroom toilet because she can't get up. Having knee surgery in 2 weeks. My wife can use this when travelling. A famly member needs a little assist getting up from the toilet. I am short and with other supports my feet do not touch the floor. Roommate needs the extra safety/assistance. Saw similar product at a friend's house. 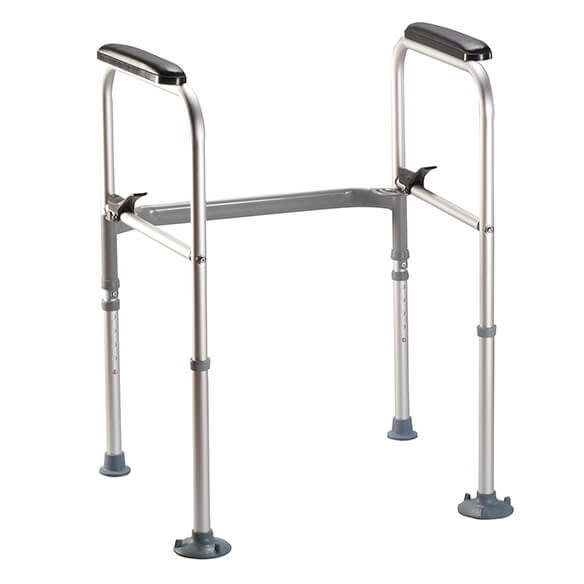 My husband recently had a hip replacement and now uses a walker all the time. Getting up and down from a sitting position is difficult. Best fits needs and at lower price than found elseware. Also pleased with customer service on previous order. It looks sturdy and like it will fit in my bathroom. I like that it is height adjustable and will work with my tile floors. 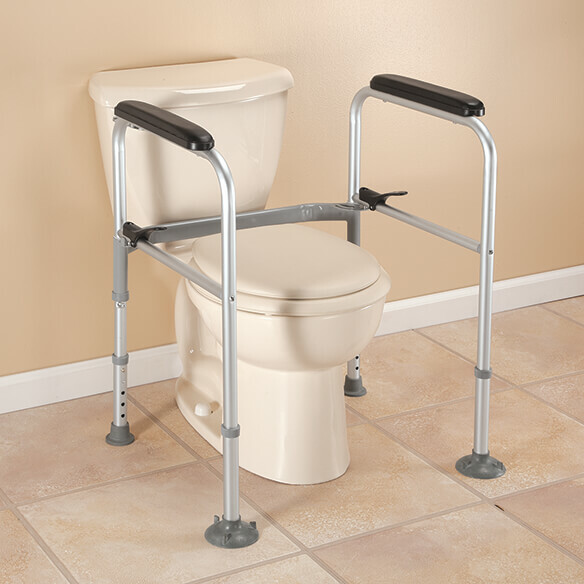 I HAVE LOOKED AT MANY ITEMS SIMILAR TO THIS TOLIET SUPPORT AND THEY EITHER REQUIRED ASSEMBLY, NOT TRANSFERABLE TO MORE THAN ONE LOCATION AND THE FLOOR LEG PADS DID NOT HAVE BRACES FOR EASY LOWING AND RISING. THIS ONE LOOKS VERY STABLE AND THIS ONE LOOKED MORE LIKE A WALKER AND HAD THE SAME STRUCTURE. I WILL NOW HAVE SOMETHING THAT CAN TRAVEL WITH ME AND BE USED JUST BY UNFOLDING. Looks sturdy and meets our needs. Our daughters toilet is very low and we have difficulty rising from it so we are sending this to her. It can be folded away, when not being used. I am hoping this will enable me to get up from the office toilet and my wheelchair. It is a big help for my hubby with his MS. It is much easier for him getting up. Only one of this kind I could find .Having major surgery and it is needed. My Mother is almost 100 yrs old and needed the extra support when she goes to the bathroom. Ever year my family rents a house on a lake for a family vacation. The houses are privately owned and are often not completely accessible. I have a raised toilet seat but if there isn't a vanity next to it it's not always eouh. I saw this and it looks like it will serve the purpose. Since we drive there the foldability will make it possible to use wherever e go. Husbands has Parkinsen's and he has problems getting up and sitting down. I need it and hope it works. It does not have to be attached to the toilet. It folds and can be carried on a car trip. I need help getting up and this will be wonderful. Can’t find it elsewhere...usually arms too close, nit comfortable, etc. Have a family member who needs it. needing a safety frame for toilet. Looks like it will be strong and sturdy. Inside width between the arms? BEST ANSWER: Thank you for your question. The width between the arms is 20”. We hope this information will be of help to you.